QC-PLC was designed to mimic the structure of QC-Gage. In fact, if you are already familiar with QC-Gage, you should be able to pick up the concepts quickly. QC-PLC uses the concept of a spec plan which is simply a set of instructions to measure a part and create a record of the data. In this case, the features of the "part" may not be related to a particular part at all and may instead be the values of a process at a particular point in time. Either way, it becomes a record in QC-CALC Real-Time. Each spec plan has a different set of traceability fields (factors) and features that can be measured. Each one can have a single sided or bilateral tolerance band and the actual is set to collect data directly from a register on any of your PLCs. You simply choose a connection (PLC) and type the address. The nominal and tolerances can even come from registers on your PLC if you wish. 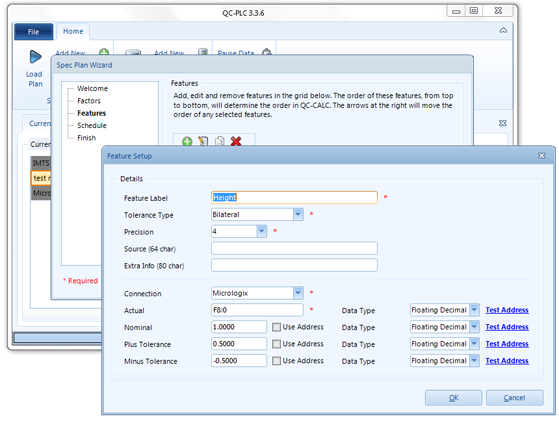 QC-PLC allows you to create connections to your PLCs (via IP Addresses) that can be re-used in any spec plan. This gives you a lot of flexibility because one "record" of data may be spread across multiple PLCs. QC-PLC's new Test Connection screen allows you to test the connections to your PLCs. 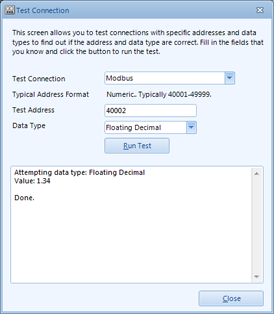 You simply choose a connection and type an address and it will query the value at that address. Depending on the type of PLC you are querying, you may need to specify a data type (integer, word, floating point decimal, etc). Otherwise, you can try all of them and QC-PLC will test the data against each type until you find the correct one to use. This allows you to make sure you have good connectivity to your PLC before attempting to write a spec plan.